So it’s the second Sunday of Lent, time for a catchup on how it is going. However, I’ve managed to last this long without having chocolate. Which doesn’t sound like much, but normally I’d have chocolate every other day at least. I’ve found that because I’m banning myself from having chocolate, the mere mention of it is setting me off drooling! I was on the train to work on Thursday, and someone in my carriage had something that smelled deliciously hot, chocolatey and cakey. The thought of a hot, gooey chocolate cake took over my mind and I couldn’t concentrate on anything for a while! I realise that the above paragraph makes me sound a little crazy, but I’ve found that when I try to give something up, even if its temporary, that thing takes over my head! One of the guys at work pointed out that the days between Ash Wednesday and Easter Sunday was more than 40 days, so we had an argument (as usual) and looked it up. Apparently you’re allowed to lapse on Sundays during Lent, as each Sunday is a “mini Easter”. I think thats cheating! One of the things I’ve been enjoying this week is thinking about the chocolates I’m going to gorge myself on as soon as it reaches midnight on Easter Sunday. 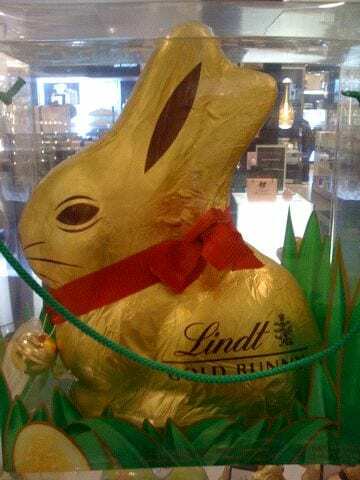 Top of my list at the moment is this bad boy, a giant Lindt bunny from House of Fraser. Look at his deliciousness. Om nom nom indeed. Hot damn! That bunny looks delicious. Well done for you for sticking to your Lent vows. I’ve never been any good at denying myself pleasure. As soon as you deny yourself something it becomes more appealing, congratulations for getting this far, I couldn’t have done it! I love Lindt but they give me palpitations they are so sweet! I’m a sucker for a Cadbury’s egg maybe with some Buttons or Creme Egg!